Posh boss Graham Westley. Photo: Joe Dent/theposh.com. Manager Graham Westley insists its now time for him to stamp his mark on Peterborough United. The Posh boss has adopted the patient approach in his six months in the ABAX Stadium hotseat, but the display of his team in the 2-0 defeat at Fleetwood on Tuesday (April 5) has prompted a change of policy. Chris Forrester should return to the Posh starting line-up for the game against Rochdale. Photo: Joe Dent/theposh.com. Westley will now root out those players he believes won’t contribute to the expected League One title push next season. He admits he has some serious decisions to make on several of his players between now and the end of the season. 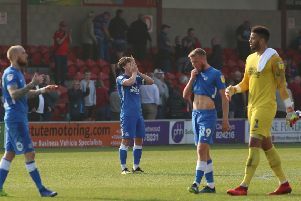 Posh still have targets for the current campaign so Westley is unlikely to give fringe players like Adil Nabi and Tom Nichols a start in the home fixture against Rochdale on Saturday (April 9). Westley said: “There was a cold-blooded fury in my words after the Fleetwood game and I hope the penny has dropped for the players. I’m not normally an emotional speaker as I like to gather my thoughts and make sure I say the right things. “I made a mistake when I managed Preston in that I went up there and stamped my size nines all over the place before I really understood the club. “I’ve not done that here. I have taken my time to find my feet. but after watching us play at Fleetwood it is definitely now time I made my mark. “I am not interested in second place. I am not interested in complacency. The players have been left in no doubt as to what I want and expect for this club. “Their response in training today (April 7) was very good, but it’s one thing training well, it’s another thing performing in a match on a Saturday when it really matters. “This is an important time for many of the players here, some of whom have been here for a couple of seasons or more. I have some serious decisions to make on many players. “This club has title ambitions next season and we only want players here who will buy into what it takes to finish first. We don’t want to carry anyone who will diminish the environment. “Players must know that the team that runs the furthest in a game tends to be the team that’s trying the hardest and tends to be the team that wins matches. “The aims for this season now are to end any lingering doubts about our League One status and then beat last season’s finishing position of ninth and beat last season’s points total of 63. “When we have done that we will think of giving younger players, or new players who have yet to play much of a part yet, a run-out to show what they can do. We are not in that luxury position yet. “All my team selections are based on merit and those who haven’t been getting a game have not done enough to earn a first-team shirt. “That’s not to say they are not working hard and doing what we are asking in order to show improvement. They are all progressing in the background as they try to move to a better level. Midfielder Chris Forrester is expected to return to the Posh starting line-up against Rochdale after being rested at Fleetwood. Jack Baldwin missed that game because of injury, but should also be fit enough to return.